In the last 15 years, downtown Phoenix has grown by leaps and bounds. Now, downtown Phoenix has a vibrant night scene, with top-rated bars, pizza places, and fun places to visit with friends and family. There’s a lot of fun, cheap things to do in downtown Phoenix, but what if you don’t feel like eating or sitting? What if you want to be up and active, but don’t want to spend a lot of money? Here are several active, cheap things to do in downtown Phoenix. Encanto Park is a popular, 222 acre park in downtown Phoenix with picnic areas, lagoon, swimming pool, nature trail, urban dishing and golf – not to mention easy parking. It’s easy to be active at Encanto, Spanish for “enchanted”, and the park isn’t far from downtown Phoenix, making it easy to get away from the downtown hustle and enjoy nature. In addition to the park, Encanto Park also hosts Enchanted Island, which offers paddle boats and canoes for rent. Get active and enjoy the water in downtown Phoenix by renting a paddle boat. For just $14 and 30 minutes, you can have a great time looking at the fish and get a workout paddling yourself around the lagoon. Not up for paddle boats? Check out the softball field, basketball and/or tennis courts, and the two golf courses nearby. Like art and walking? Then you’ll love First Fridays in downtown Phoenix! Held on the first Friday of every month, you’ll begin your walking (or trolley) tour at the Phoenix Art Museum from 6 to 10 p.m. Phoenix’s First Friday art walk is one of the nation’s largest self-guided artwalks, and the event also offers free shuttles throughout downtown. The Phoenix Art Museum is located near the Central and McDowell light rail station and is one of the four Artlink Phoenix First Friday trolley hubs, making it easy for you to get to first Friday, walk around, and get back without having to deal with parking downtown. Didn’t think you would see the Phoenix Art Museum twice, did you? That’s how wonderful the Phoenix Art Museum is! Admission to the Art Museum is free on Wednesdays from 3 to 9 p.m.
Once a month, the Phoenix Art Museum offers Make It!, a monthly drop-in, family-friendly, hands on art-making activity. Make It! is always offered on Wednesdays, and each month features a different activity inspired by the Museums collection or current exhibitions. In addition, each month also offers access to local artists, who attend Make It! and participate in activities designed to introduce participants to new materials and perspectives. Just down the street from the Art Museum is the delightful Heard Museum, a treasure trove of American Indian art – and more. The Heard Museum general admission is also free from 6 to 10 p.m. on First Fridays and is a can’t miss stop for Native American art, specifically Southwest Native American art. Special exhibits may be extra. Not able to visit the Art Museum or Heard (or many other Phoenix cultural destinations) during First Fridays or other free admission days? Don’t fret – you can still visit certain cultural spots for free on your own time with a Culture Pass. Offered by Phoenix public libraries, Culture Passes are a not-so-well-kept secret of Phoenix natives. Culture Passes are available for a variety of wonderful places, including the Art Museum, Heard Museum, Arizona Science Center and more. However, make sure you regularly check for Culture Passes, because this secret is being discovered and Culture Passes are quickly checked out. Note: you can’t request Culture Passes, they’re in-library use only, so call ahead and make sure the pass is there before you drive over. Secret tip from a Phoenix native: Check out Culture Passes beyond your local library – some of the smaller Phoenix library branches will have available Culture Passes people have missed because they don’t want to drive to those smaller branches. Spend a little time driving to spend a lot of time enjoying your favorite locations – for free! Take a break from your Saturday farmer’s market shopping to do some yoga, offered every Saturday morning from 10 to 11 a.m. Urban Yoga teaches this free class right in front of DeSoto Central Market, next to the bustling Saturday farmer’s market. Go early to get your produce and to get a spot for yoga – this popular free activity fills up fast! Tip: Bring water, a mat, and arrive early. 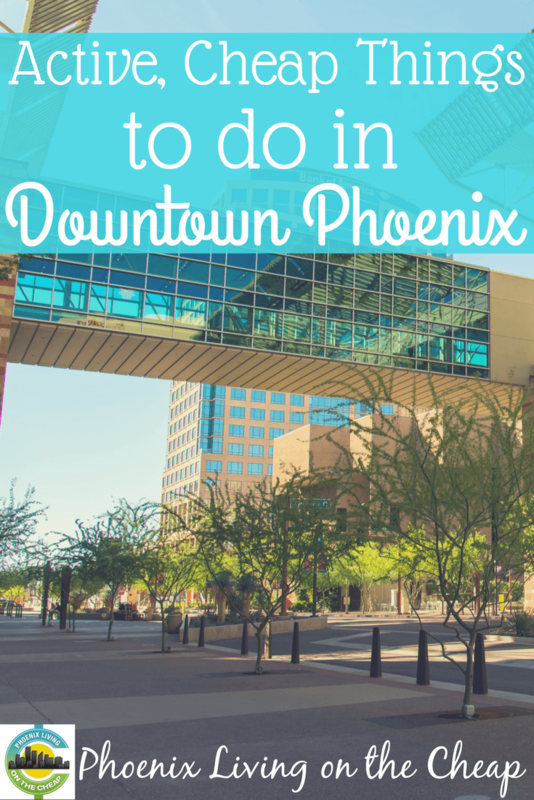 There are always fun things to do in downtown Phoenix, and many of them are either cheap or free. Notice something I missed? Leave a note in the comments and I’ll include it in the next round up!